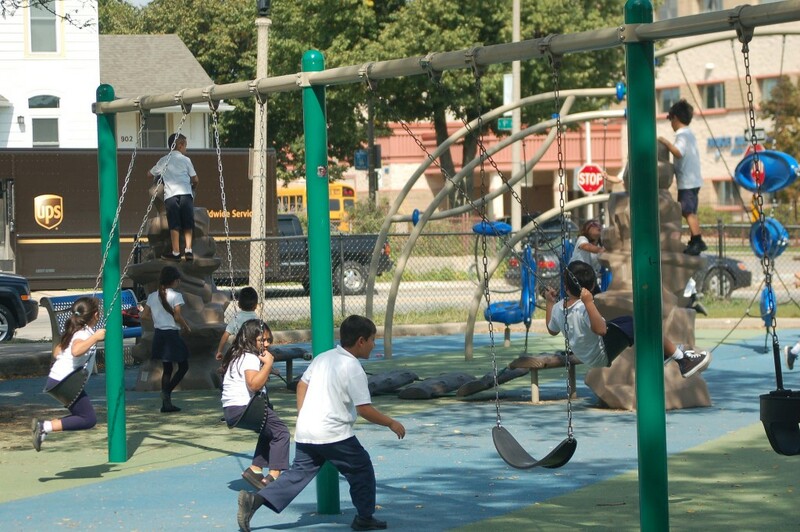 Bruce Guadalupe Community School students play at the park during recess. Photo by Edgar Mendez. Following a report last week by Milwaukee Neighborhood News Service that United Community Center (UCC) had never paid a 2012 pledge of $20,000 to help rebuild Walker Square Park, the organization is now ready to make good on its promise. According to Megan Haeger, contracts and projects manager for the county parks system, the county now has a signed contract from UCC, which will be presented to the Board of County Supervisors for approval on Oct. 27. Once the contract is approved, an invoice will be prepared by the county and sent to UCC for payment. The Bruce Guadalupe Community School is run out of the United Community Center, 1031 S. 9th St. Photo by Edgar Mendez. In an interview with NNS on Sept. 15, Pascual Rodriguez, principal of Bruce Guadalupe Community School, denied making the $20,000 commitment. Juan A. Ruiz, deputy director of the UCC board and its Chief Finance Officer, said the organization was still waiting for an invoice for the project, which was completed three years ago. The county claimed that an invoice could not be created unless a contract had been signed. Documents obtained by NNS through a Freedom of Information Act request showed Rodriguez had indeed committed $20,000 from UCC towards the park, but that a contract sent to him by the county was never signed and returned. 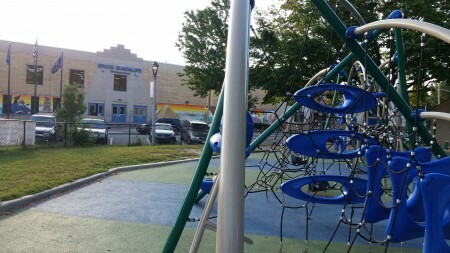 Eventually, the $20,000 payment will go to repay playground debt, including that incurred from the Walker Square Park playground project, according to Haeger. Samantha Wilson, a member of the Walker Square Neighborhood Association (WSNA) board, said she’s happy to hear that UCC is finally making good on its promise. Wilson and other Walker Square residents have been at odds with UCC in recent years over what they’ve described as Guadalupe’s excessive use of the park and unresponsiveness to the needs of nearby residents. “I really hope they will work more with the community from now on to repair trust and improve relations,” said Wilson. In response to the criticism, Steiner emailed, “With more than 2,000 people utilizing the United Community Center on a daily basis we understand there are challenges that occur and impact the neighbors.” Steiner added that UCC is committed to working with the WSNA and neighbors to help alleviate the problems.